The Sprint One Million Project is giving free smartphones to high school students along with unlimited data and high-speed internet. 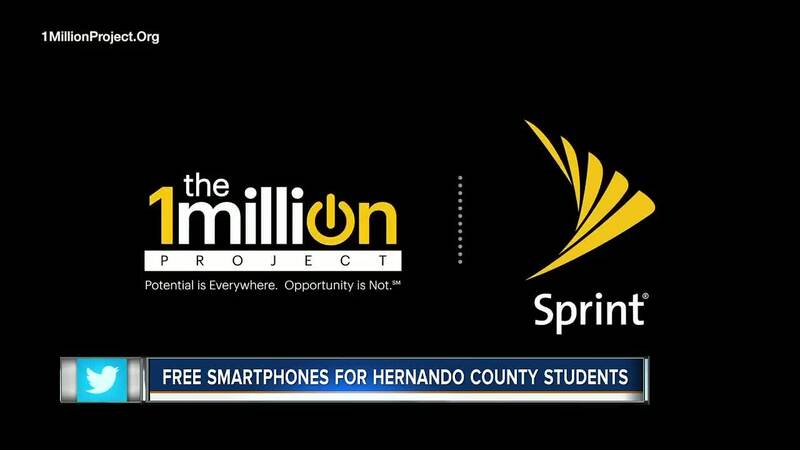 HERNANDO COUNTY, Fla. — The Sprint One Million Project is giving free smartphones to high school students along with unlimited data and high-speed internet. Jesse Florkowski, a junior at Nature Coast High School, says his free smartphone with unlimited data, high-speed internet, and hot spot capabilities has helped improve his grades. "I use this every day and if I didn’t have it I would have to be rushing and rushing just to finish things before I even left school," said Florkowski. Sprint says 70 percent of teachers assign homework that requires internet access and a lot of families can’t afford the internet or smartphones. So the "One Million Project" goal is to give away a million smartphones to high schools across the nation for students in need, with the purpose of filling in that homework gap. "I had a student a couple of weeks ago that has never had a cell phone ever. So he’s been sitting in class and they’ve been doing things on the phone and on the internet and he hasn’t been able to participate. I’ve never seen anyone so happy. He came last week. We gave him a phone and he was super excited," said Jodi LaRocca, Sprint program coordinator for Nature Coast High School. All high schools in Hernando County and some in Pinellas County use the program. Hernando County says more than 1000 students have participated. Saving parents up to $1000 a year on a phone and service. I’ve had parents call to thank me too because on there own they wouldn’t be able to afford for them to have that monthly service. Sprint says their mission is to give all students the same chance to succeed. For more information go to 1millionproject.org .